Due to their high gyromatic ratio, the detection of protons can much increase NMR spectral sensitivity compared to the detection of heteronuclei such as carbon or nitrogen. The advent of 1H-detection in biological solid-state NMR spectroscopy has indeed marked a milestone and it can be forseen that this technique will become the new standard to study solid proteins. However, to harness non-exchangable protons (such as aliphatic protons or protons of the transmembrane part of a membrane protein) is still a significant challenges to solid-state NMR spectroscopists. This is critical roadblock to the use of 1H-dectection to study proteins, given that such protons are mandatory to understand protein structure and function. We have recently introduced a number of new approaches to to make 1H-detection more amenable to membrane proteins. These approaches allow probing structure and dynamics of membrane proteins, even in situ directly in native cell membranes. Examples are shown below. 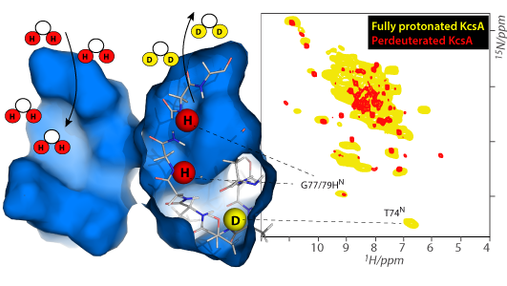 We have recently introduced a new labeling approach - dubbed Fractional deuteration - for 1H-detected solid-state that gives access to very-well resolved backbone and side-chain protons of proteins (see Mance et al., Angew. Chem. 2015). In fact, for non-microcrystalline proteins such as membrane proteins or fibrils, this approach is much more benefitial than the traditional perdeuteration approach, as we showed on the membrane-embedded ion channel KcsA. This article was also selected as NWO Chemical Highlight (in Dutch). 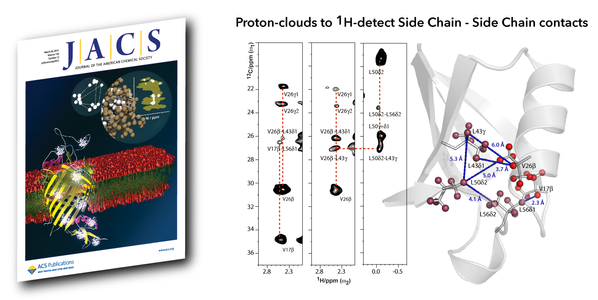 Furthermore, we have demonstrated that selective labeling of proteins with protonated amino acids embedded in a perdeuterated matrix, dubbed ‘proton clouds’, provides general access to long-range contacts between nonexchangeable side chain protons in 1H-detected solid-state NMR (see Weingarth et al. JACS 2014). This article was selected for the Cover of JACS (see also Comment). 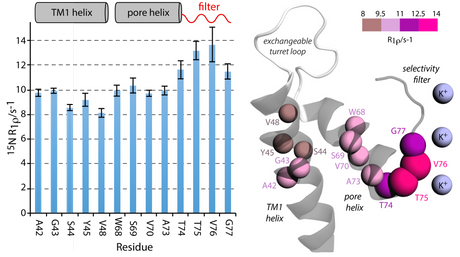 The common prerequisite for 1H-detection is the introduction of exchangeable protons in otherwise deuterated proteins. This has thus far much curtailed studies of partly water-inaccessible protein regions, such as the transmembrane part of membrane proteins or the hydrophobic core of amyloid fibrils. We have recently demonstrated for the first time the feasibility of proton detection of fully protonated membrane proteins on the example of an ion channel (see Weingarth et al. JACS 2014) - which abolishes the necessity to reprotonate exchangeable protons altogether. This labelling scheme (Silva et al, Angew. Chem. 2016) also provides access to water-inaccessible protein regions, but with a much better resolution than in fully protonated proteins. This approach even works highly complex environments such as cellular surfaces. We used our approach to 1H-detect - for the first time - a membrane protein directly in situ, i.e., directly in a native bacterial cell membrane. 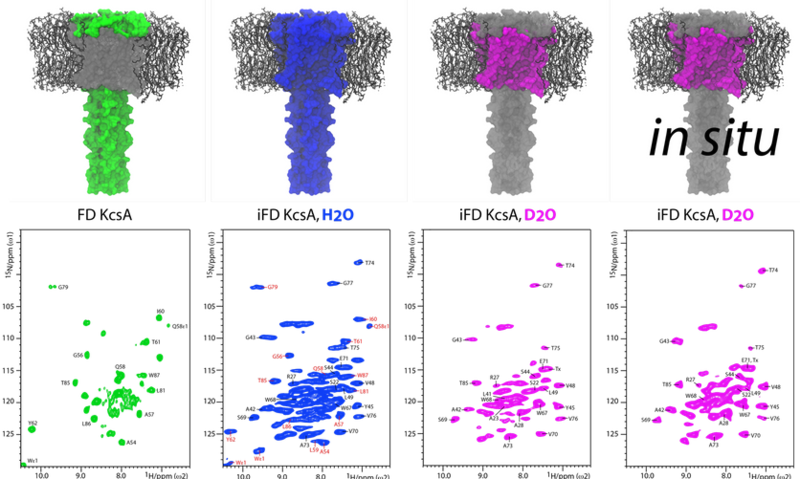 Moreover, thanks to the great resolution provided by inverse fractional resolution, we could, for the first time, use 1H-detection to study the site-resolved dynamics of a membrane protein. We found that the selectivity filter of K+ channel KcsA shows enhanced dynamics, which is likely relevant for function. We are currently investigated the dynamics in greater detail.